The remaining newsstands across the nation are still dotted with magazines featuring photos of George Clooney’s Venetian wedding to British barrister Amal Alamuddin. This controlled embrace of the paparazzi on Clooney’s wedding day was motivated by charity rather than the typical celebrity cash grab. All proceeds are going to Clooney’s newest attempt to combat mass atrocities in Africa—a spin-off of his ambitious and effective Satellite Sentinel initiative, which will be directed at following the money that funds massacres. The story is an extract from an e-book by Alex Perry which details the humanitarian roots of South Sudan’s independence and subsequent bloody struggles, weaving it into a tale of well-intentioned but ultimately doomed western interventions across the decades. Clooney is the celluloid straw man—an out-sized outsider whose determination to “do something” ended up propelling the birth of a nation that was not ready for freedom. The contrast between the magazine covers presents its own noxious irony right up front: while Clooney is consciously leveraging his celebrity to get people to care about something bigger than celebrity, the Newsweek critique is leveraging Clooney’s celebrity to simply sell magazines. After all, a cover story about South Sudan wouldn’t exactly fly off the shelves—but frame it as some sort of celebrity scandal and maybe people will buy the thing. We all get the joke. But I’m not laughing at this one. Cynicism often gets dressed up as world-weary wisdom. But it’s an essentially lazy pose, pretending to be clever while absolving the bearer of actually trying to solve problems. And trying to pin South Sudan’s problems on George Clooney absurdly misses the point while also rewriting recent history. Most of all, it disrespects the 98% of South Sudanese who voted for independence in 2011 after decades of a bloody civil war which killed 2.5 million people—more than any conflict since the Second World War. On the night of January 9th, 2011, Juba was the most joyful place on earth. By the banks of the Nile, I was covering the independence referendum for an earlier incarnation of Newsweek, travelling with Clooney and Enough Project Founder John Prendergast. And while Clooney was the hook for Western readers, the story was really about celebration—the delivery of democracy by the ballot box rather than the bullet. Despite the massive margin of victory, there was nothing inevitable about the outcome. While international outrage at the ethnic cleansing in Darfur in 2004 raised awareness about the suffering of the Sudanese people under the thuggish theocratic regime of Omar al-Bashir, a peace deal brokered by the Bush administration offered the chance for a peaceful referendum on separation between the largely Arab and Muslim north of the nation (where Osama bin Laden hid out for much of the 1990s) and the African and largely Animist and Christian south. But as the referendum day fast approached, no actionable plans were being made for it to proceed and so a renewed civil war loomed. The point is not that Clooney deserves all the praise (or blame) for South Sudan’s independence. But there’s no question that he elevated the issue to such an extent that ignoring the previously agreed upon referendum became impossible. Clooney used his media influence to serve as an early warning system, helping people remember their promise to “never forget” slaughters like Rwanda. Warnings from the Secretary of State and the UN Secretary General couldn’t make people give a damn. Clooney could and did. Got that? Just because Clooney could help stop a slaughter and give rise to a referendum doesn’t mean that he should have done it. Perry implies that the better path might have been some kind of benign neglect by the international community, quite possibly while Sudan and its southern citizens waged a new civil war. It would all work itself out in time. “How, really, could you foster someone else’s independence?” Perry muses. “Surely, the whole point of independence was that people had to do it for themselves.” In this, Perry might want to consult a quick history of French aid in the American Revolution or reflect on the international role in undermining apartheid in his own native land. The world didn’t begin with the Iraq War. But Clooney is really just a framing device for the story’s larger target—Western humanitarian interventionists, who Perry traces to a PR guru during the Biafran civil war in the late-60s that birthed that well-known league of bad actors, Doctors Without Borders. Perry then hop-scotches to Charlie Wilson’s War-era Afghanistan, Boomtown Rat Bob Geldof’s Live Aid relief concerts in the face of Ethiopian famine and 1999 Kosovo where, Perry blithely explains, “NATO bombed the Serbs out of humanitarian concern.” Here he’s able to tie in Obama’s UN Ambassador Samantha Power’s previous incarnation as a journalist and author of “A Problem from Hell” to condemn the resurgence of liberal interventionism and the adoption of the UN’s “Responsibility to Protect,” known as R2P. In a few neat sentences, Perry turns the idea of moral obligation into moral relativism. And that’s what really ought to make your stomach turn. Humanitarianism becomes Imperialism. Ethnic cleansing becomes a geo-political lifestyle choice. And condemnation of such slaughters outside sovereign borders becomes thinly-veiled racism, a reflection of deep-seeded Islamophobia. Perry is on more stable ground when he details the impotence of UN bureaucrats in South Sudan as they go about life in their bunkered bubbles, disconnected from the people they are supposed to protect. He catalogues the sloppy flow of outside money and its failures to transform the country. And he tallies the tribal power plays and party purges by South Sudan’s president Salva Kiir, which have led to bloody battles and unjust imprisonment that threaten to tear the world’s youngest nation apart. His descriptive reporting can be compelling. Perry enjoys raising questions but he’s reluctant to offer anything resembling answers. It is the luxury of the professional observer. Yes, there are unintended consequences to every action. But that doesn’t mean we shouldn’t take action, especially when genocide threatens to rear its ugly head. And the piece’s ultimate criticisms of Clooney—that he empowered a would-be dictator and abandoned the country after midwifing its birth don’t pan out when confronted with research or facts. 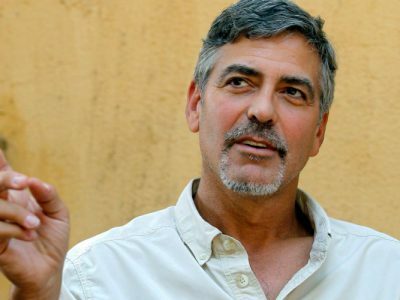 Clooney’s commitment to South Sudan has continued. His SatSentinel, a privately funded, publically accessible satellite executed through the Enough Project, DigitalGlobe, and the Harvard Humanitarian Initiative has documented real-time troop build-ups along contested borders between the north and south and provided indelible evidence of slaughters and razed villages. He’s leveraged his commercial status as a spokesman for Nescafe in Europe to convince the company to invest significantly in the production of coffee in South Sudan, which was a major cash crop there before the civil war. Coffee is now the second largest export from South Sudan, after oil. And his newest project, which the sale of his wedding photos will help fund, promises to track the assets that have been stolen from the South Sudan treasury to fuel the fighting. By any measure, this sustained support is evidence that one person can make a difference, not out of short-term self-interest but a long-term belief that winning the peace is every bit as essential as winning a war. If someone wants to dismiss this as do-goodism, fine, but it has real world effects. Amid grim alternatives, Clooney helped remind us all that one man still can make a difference. And that’s why he remains the rare celebrity worth celebrating.